If you have been surfing other blogs for awhile, you have probably seen many photos of things that inspire you. It might be a photo of a landscape or sunset. It might be a single tree, a car, or even an animal. It could be a close-up of something fascinating, such as someone’s intricate quilting stitches. It could be embroidery, a quilt from a quilt show, or a fabric that you’d like to find. How do you keep track of all these ideas? I keep a folder on my computer called “Inspirational.” When I am surfing and see something that makes me think, or that knocks my socks off, or that gives me an idea for something ELSE, I right click it and save it to my folder. I can go back to the folder at a later time and look at all these photos and instantly be inspired. Before the advent of the Internet and blogging, I did something similar. It was a folder with scraps of paper in it, torn from magazines and newspapers. I clipped everything that grabbed my attention and tucked it into the folder. My Inspirational folder on my PC works the same way. NOW, with that being said, there is something called COPYRIGHT, and I am very serious about not stealing other people’s creative work. In the 80’s when I had written my first book (America’s Pictorial Quilts) someone took a whole chapter from the book and had it published in a magazine with their name on it. Guess who acted quickly on that issue? So don’t violate copyright. At all. It’s ok to get inspired by someone else’s work, but don’t copy it. In this peek at my folder, you can see some full shots of quilts. You can also see close-ups. There is a Tiffany postal stamp, a landscape (bottom left corner), and the painting called “July: Specimen of a Portrait” by Jacques-Joseph Tissot, a French painter from the 1800’s. I love his use of sunlight! If you are a quilter, your quilt might be included in my folder. Some of these photos inspire me for their color choices, like the quilt Boardwalk. The quilt Northwind grabs me for the way the colors are blended together. Top row, center is amygarden, a fabulous applique quilt. And then there are the photos of what I consider to be the best of quilting designs (top left corner and the photo called “quilting.” So you see, there are reasons why I want to save these photos. They get my creative juices flowing much in the same way a new quilt book does. How do you get inspired? What excites you? Real Men Quilt – vibrant, hand-dyed colors and amazing quilting! Field Trips in Fiber – Vickie’s quilting does knock my socks off! Ivory Spring – Wendy – WOW! Her work is meticulous. 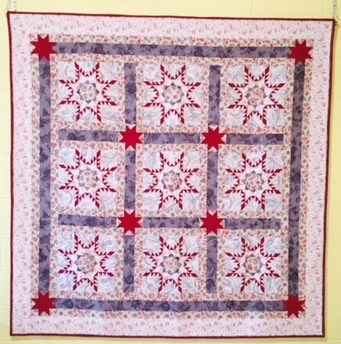 Ronda’s Creative Quilting – amazing quilting and great quilts! I do the exact same thing in a folder called Quilt Inspiration. I have a great little collection of pattern, colours and quilts to inspire and admire. Every so often I just scroll through them just to remember what things inspire me – dream of possible future projects. Great minds think alike! I keep a folder on my computer called, Quilting Inspiration. I also keep a notebook/scrapbook where I make notes of patterns or books that I want to buy in the future as well as where I use old fashioned paste and paste pictures and articles that I find in magazines and other places for later inspiration when I am in a “dry spell”. Hi Caron,I am just now catching up with my blog friends! I trust that you had a good Christmas. Mine came and went just a bit too fast… but we enjoyed it nonetheless.It is such an encouragement to me to know that my work inspires you. You inspire me too with your style of quilts. I think quilting has done so much to bring women together.Blessings to you and yours in the New Year!